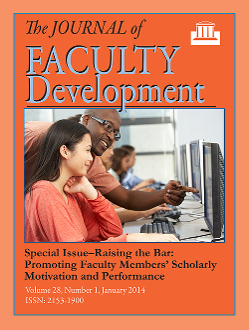 Raising the Bar: Promoting Faculty Members’ Scholarly Motivation and Performance published January 2014. In a climate of increased expectations, work demands and accountability, university and college administrators need strategies to help them promote and support faculty members’ scholarly motivation and performance. Each of us has best strategies that could be used by our peer institutions to achieve similar/shared goals. This special issue of the Journal of Faculty Development spotlights the most successful and promising strategies from college and university deans and associate deans, and others with roles relevant to faculty performance. Submissions should include the following elements of the strategic approaches: the needs or issues that they address, theories/principles that support their selection and strategic design, specific components of the activity or initiative, and evaluation of target outcomes. This article describes the evolution of a faculty scholarship symposium within the school of education at a regional comprehensive university. The article outlines the initial structure and goals of the symposium as well as the development of the model over time. The influence of leadership, culture, and individual goals and backgrounds are explored through a discussion of opportunities and challenges embedded in the initiative. The aim of the article is to provide administrators and faculty members with an understanding of one approach to cultivating scholarly motivation and productivity among faculty members in similar disciplinary and institutional contexts. With the growing recognition of the importance of interdisciplinary research, many faculty have increased their efforts to form interdisciplinary research teams. Oftentimes, attempts to put together such teams are hampered because faculty have a limited picture of the research interests and expertise of their colleagues. This paper reports on three major initiatives supported by the Office of Research in the College of Education at Florida State University aiming at increasing interdisciplinary research among faculty members, namely the design and implementation of (1) a college-wide faculty research interests/expertise database, (2) a college-level research grant program, and (3) a multi-college research conference. Many universities have observed needs and shared goals that include increasing faculty members’ research productivity (in quantity or quality). Strategies for raising faculty performance include revising standards and supporting valued outcomes with rewards and incentives. One college at a research-extensive university received institutional funding to pilot a faculty rewards and incentives program to enhance scholarly productivity. This paper shares the goals, design and initial implementation of that program, as well as the range of faculty members’ and units’ initial responses. It demonstrates a strategic process of using standards to align faculty performance trajectories with changing academic and organizational needs. Faculty members are critical assets to universities, and large losses to institutions occur if they are not successful. Although institutions value publications and grants in the tenure process, newer professors receive little guidance in writing for these endeavors. Faculty writing retreats help apprentice professors in the craft of writing; however, little research has explored how public institutions on limited budgets can hold effective retreats. To meet this call, we piloted a writing retreat at a large, public research university to steer the junior faculty toward increased motivation and productivity. Results informed development of recommendations for other institutions to design effective retreats. Administrators seek faculty who have the expertise to secure external funding to support their research agenda. Administrators also seek strategies to support and enhance faculty productivity across different ranks. In this manuscript, we describe the infrastructure we established and strategies we implemented to enhance the research enterprise at the college level. We situate this work using a framework developed by Wedman and Graham (Wedman 2008; Wedman, 2010) which outlines critical components of developing an organization that values, supports, and develops expertise related to securing external funding. Research productivity and collaborations are essential aspects of advancing academia. Publishing is a critical mechanism in higher education to allow faculty members to share new information in all disciplinary fields. Due to its importance, scholarly work is often heavily considered for promotion, tenure, compensation, and other merit decisions. Social network analysis (SNA) offers a useful methodology for evaluating productivity and collaborations within research networks. The purpose of this paper is to present a primer of SNA and demonstrate how SNA can be used to discern faculty research productivity and collaborations in highly integrated and complex research networks. Positive, student-centered learning environments and the professional development opportunities which support those environments, while crucial, are not easily built or sustained. As a result, instructors often spend semesters or even years in the classroom with no barometer for effectiveness and change in their pedagogical approaches other than their students’ test scores, verbal or written feedback, or anecdotal discussions. One means for promoting student-centered learning and remedying the isolating nature of instruction is through a Teaching Partners Program (TPP) where new and veteran faculty members explore the concept of teaching domains and support one another’s teaching efforts through conversation, monthly team meetings, and cross-disciplinary classroom observations. Adjunct instructors are the fastest growing population of faculty in the academy; and, given the current economic condition and its impact on institutions of higher learning, the proportion of adjunct faculty is likely to increase (Gappa, Austin & Trice, 2007; NCES, 2011). Yet the adjunct population continues to remain disconnected from the academy, as few institutions have yet to dedicate the time, resources, and communication channels necessary to support their work. Paradoxically, at the same time institutions are becoming more and more reliant on this contingent labor force (Bombardieri, 2006; Finder, 2007; NCES, 2010). Few researchers have investigated the motivations, preferences, and barriers that exist for adjunct instructors who wish to participate in professional growth opportunities. To usher in the paradigm shift needed to professionalize development opportunities for this critical population, adjunct instructor voices and perspectives must be a part of the research design. In this article, we offer strategies based on research involving over 600 online adjunct instructors and propose recommendations for institutionalizing faculty support based on these findings. This article describes the Asa G. Hilliard III and Barbara A. Sizemore Research Institute on African Americans and Education, a future faculty program designed to encourage doctoral students to enter the professoriate and study the African American experience in education. African Americans represent 1.3% of all computing sciences faculty in PhD-granting departments, underscoring the severe underrepresentation of Black/African American tenure-track faculty in computing (CRA, 2012). The Future Faculty/Research Scientist Mentoring (FFRM) program, funded by the National Science Foundation, was found to be an effective strategy in increasing the number of tenure track faculty hires by 11% (Charleston & Jackson, 2011). This manuscript describes a new program, the Institute for African American Mentoring in Computer Sciences (iAAMCS), which capitalizes on the successes of the FFRM and other mentoring models. The iAAMCS endeavors to improve faculty representation through a national mentoring model. Patricia Hardré, Ph.D., has worked in higher education for more than two decades, as an adjunct instructor, a faculty trainer and training designer, a tenure-track faculty member and a college administrator. She is currently a Professor of Educational Psychology at the University of Oklahoma, and has published more than 80 peer-reviewed articles and book chapters. She teaches graduate courses and mentors graduate students in research and measurement, instructional design, project management and program evaluation.